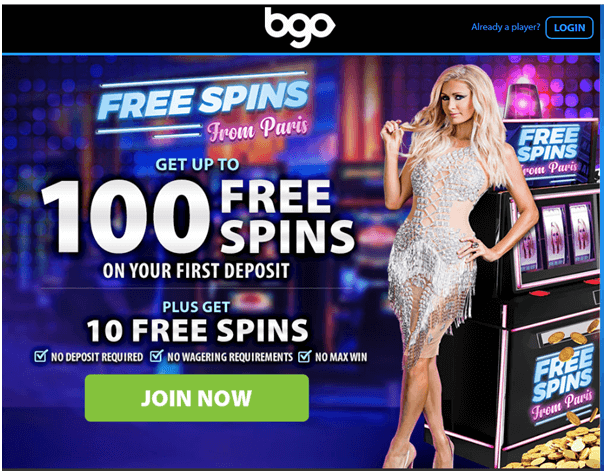 BGO Casino is one of the best UK friendly online casinos that offer awesome free spins and wonderful assortment of slot games from top notch branded gaming providers like Playtech, iSoftBet, Netent, NextGen Gaming, IGT, Red Tiger Gaming and others. You can play slots, live casino, table games, Bingo games and take part in various slots tournaments. You can play with your mobile by downloading BGO casino free app from iTunes for iPhone and iPad and from Google Play store for your Android mobile. How to get started at BGO Casino? It’s simple. Just tap or click on the Join Now button located on the right hand side top corner of the online casino homepage. Now fill a short form with few of your details like your name, Date of Birth, Email and set a password to login. After that you need to enter your phone number and address. 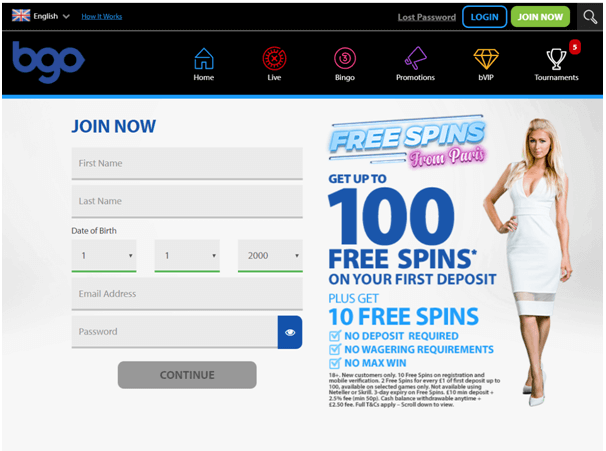 Finally you are done now and are ready to make a deposit and get 100 free spins on your first deposit. You’ll be automatically credited 2 Free Spins for every £1 of your first deposit, up to a total of 100 Free Spins. Or deposit £50 and get 100 Free Spins! Your Free Spins can be used to play slot games specially the new ones like Fishin’ Frenzy, Eye of Horus, Slots O’ Gold, or Diamond Jackpots and more. They’ll come with no wagering requirements and no max win. You can make a deposit with PayPal, Skrill, Neteller, Credit cards or Paysafe card. Remember you are playing at a safe and secure casino as BGO casino is licensed and regulated by the Alderney Gambling Control Commission. Top Cat is themed on the classic Hanna-Barbera cartoon from the ‘60s. This is 20-payline slot where you team up with Top Cat and the Gang Developed by Blue Print Gaming, Top Cat also has his own Master Plan Bonus to help you earn a quick buck in 1 of 5 mini games. It features a big progressive jackpot and modifiers that can be activated on any spin by alley cats Benny, Brian, Choo or Spook. 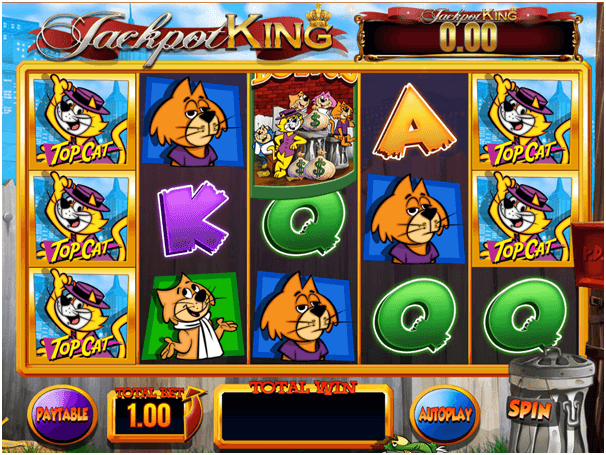 Top Cat slot game is a five reel slot game with three rows and twenty fixed pay-lines. There are some nice extra features available for the player that takes the form of bonus mini-games that you can trigger, and you can place bets from a mere 20p and maximum £500. The higher value symbols on the reels are the characters from the show. The wild symbol on the Top Cat slot is represented by the rotten blue fish on a plate with the word “WILD” underneath. This symbol will substitute for all other symbols on the reel except for the bonus symbol which is a group portrait of the cats with the word “BONUS” at the top. Primarily the wild symbol helps players pick up more winning combinations. Master Plan is the main bonus feature of the Top Cat slot game and involves landing the bonus scatter symbol anywhere on reels 1, 3 or 5. It will result in you being able to choose a plan on the notice board which will reveal bonuses including the cash picker bonus, diner free spins, maharajah heist, Dibble’s free spins and construction site wilds. It is a great bonus feature. Also four small bonuses trigger randomly when playing the base game: Benny’s colossal, Choo’s piano wilds TVs, Spook’s mice is nice, and Brain’s water wilds will all trigger randomly and offer a variety of bonuses. 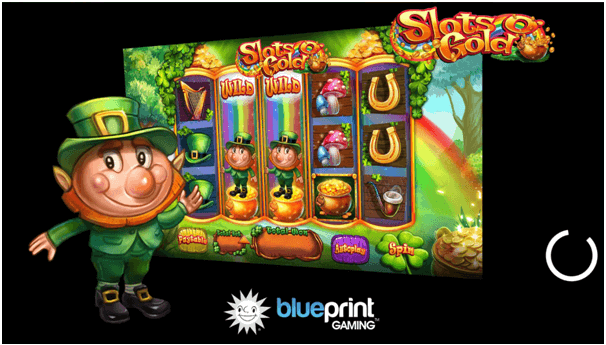 Slots O’ Gold is inspired by traditional tales of Irish luck, this 10-payline slot game transports you to a land of rolling hills and magical leprechauns to search for a big jackpot win. 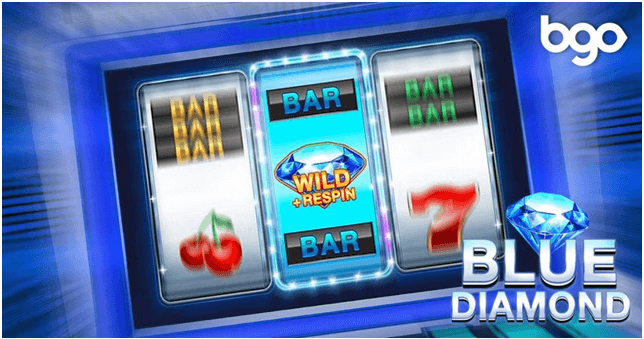 This slot at BGO casino by Blue Print Gaming is connected to the celebrated ‘Jackpot King’ progressive which has been known to reach over £1 million! You’ll also want to look out for Leprechaun Wilds with the power to trigger a Rainbow Re-Spins Bonus, where you could discover another big pot o’ gold. As all pay lines are permanently enabled, all you have to do is select your bet and decide whether you wish to engage autoplay. Bets start from 25p and rise to a maximum of £500 per spin. The leprechaun is the Slots O’ Gold slot game’s wild symbol. The leprechaun is particularly cheery looking and is the key to rainbow respins. Whenever you land a wild, rainbow respins kicks in. The wild stretches to fill its entire reel. Then it is held in place while the other reels spin again. With multiple wilds on the reels, you have a far better chance of landing a high return. Slots O’ Gold slot has one final feature which truly sets it apart from the crowd, and that is its incorporation of a progressive jackpot. In order to claim the jackpot, you’ll have to look out for the jackpot King symbol. Land 5 of these on an enabled pay line and you’re in for a life changing sum of cash. The current level of the progressive jackpot is displayed at the top of the reels during every spin. 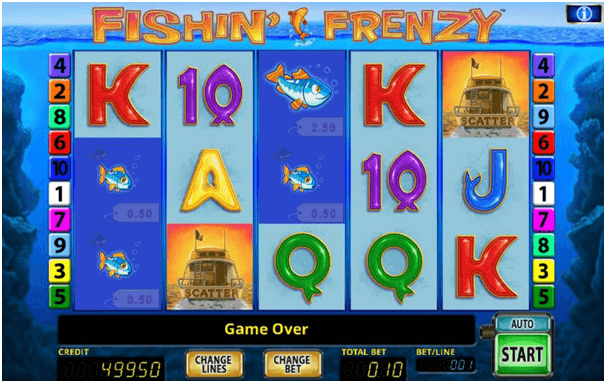 Fishin’ Frenzy slot developed by RTG and Merkur gaming comes with up to 10 pay lines. This 5×3 grid marine-themed video slot gives you a thrilling game experience and it is loaded with amazing features. All the thematic symbols are designed to complement the theme, such as sea animals, fishing tools, and fish-shaped letters. On the game screen you will find on the upper right corner Information button that shows you the Paytable instructions and the symbol value. Low-value symbols are card symbols – A, K, Q, J and 10 coloured in different colours and the cute cartoon fish symbols. The high-value symbols are symbols of life ring, a fishing box full of baits, fishing rod and a seagull. The game is available at £0.01 per spin, but if you want to maximise your chance of winning you can bet on up to £10.00 – so the Fishin’ Frenzy slot is a great match for all the pocket sizes. When you get a winning, you can Gamble on it and double the amount if you correctly guess the colour of the card. Set your desired bet and watch the reels spinning while you are getting great bonuses. Talking about the bonus features, there is a Scatter symbol represented by the boat romantically going into the golden sunset. Depending on how many of these you find on the reels, you can get some Free Spins: 3 of them give you 10 free games, 4 give you 15 free games and 5 give you 20 free games. Although this feature cannot be retriggered, the symbol of a successful fisherman can be activated during the Free games. It catches the fish with price tags symbols for additional wins, meaning that a total of their value is then added to your prize. Eye of Horus slot game has 3 rows, 5 reels, and 10 selectable pay lines. Developed by Merkur games and RTG it is the mysterious journey in the Ancient Egypt where you decrypt the tablets on the wall of the pharaoh’s tomb to find the great treasures. Horus is one of the most significant deities of Ancient Egypt and his eye is the symbol of protection, royal power and good health. High-value symbols are represented as the Ankh symbolising life, the scarab standing for rebirth, the Anubis shrine and other symbols related to Egyptian mythology while playing card icons deliver low payouts. The eye of Horus is the most valuable symbol awarding 500x your bet. Horus himself stands for Wild whereas the Golden Door represents Scatter. 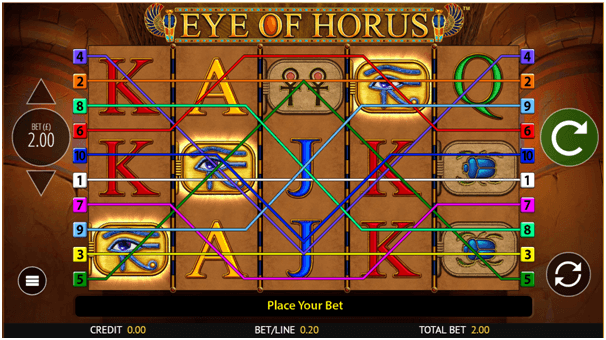 The Eye of Horus slot game uses 10 adjustable pay lines. For the best odds of winning, try to keep them all active. 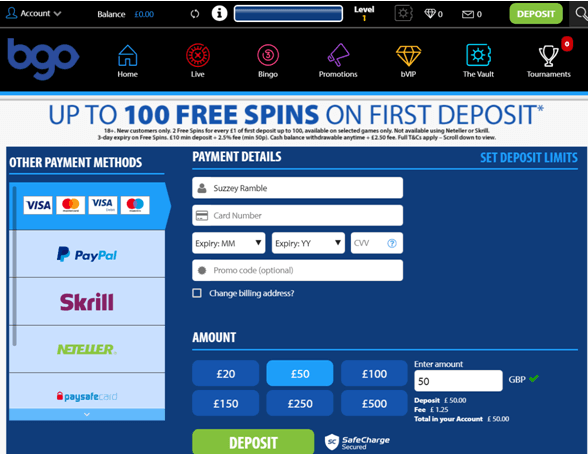 Players can wager between £0.01 and £1 per line meaning that a total bet per spin can be anywhere between £0.10 and £100. The Max Bet option is available and to win a prize you need to match at least three identical symbols in a row on an active pay line left to right. The sacred doors of the pyramid will be opened once 3, 4, or 5 Scatter Pyramid symbols show up on the reels. Play 12 free games to find the treasures hidden in the ancient tomb. During the bonus game 1, 2, or 3 Horus murals appeared on the screen add 1, 3, or 5 spins respectively. In addition, with the ray of the garish divine light Horus upgrades the tablets in the particular order as it shown above the game reels. The mural of Horus acts also as the Wild symbol in this casino video slot. It expands covering the whole reel and substitutes for all symbols, except for the Pyramid. 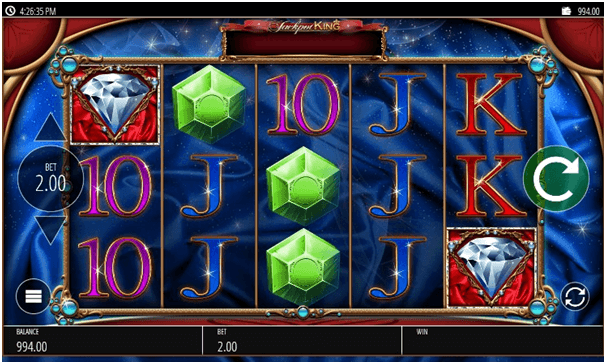 This online slot game also contains two built-in gamble games. You can use one of them after the winning spin in order to increase your prize. Diamond Jackpots developed by Blueprint gaming is full of luxury of gems and diamonds and is complemented by a hefty progressive jackpot. In this five reel slot with three rows and twenty five fixed paylines; you will find bronze frames surrounding the reels accessorised with blue orbs in each corner. There’s a star-spangled backdrop and of course the progressive jackpot total displayed above the reels. There are four high value symbols including the huge diamond, a red ruby, some jade and what is possible a lump of quartz; 10, J, Q, K and A make up the lower values. There are no wilds or other special symbols in Diamond Jackpots although it’s worth noting that landing a grid made up entirely of diamonds will pay out a massive 10000x your line bet. This is the game that has caused a stir in the online gaming arena and it’s time to play this game at BGO casino. Developed by Red Tiger Gaming this game will surely give you a good return. The game has only 3 reels and one payline. The symbol is a solid rectangular brick with the word BAR printed on it in capitals. You are expected to be seeing a lot of BARs in Blue Diamond. Note that BARs are traditionally among the highest ranked slots symbols, and so it proves to be in Blue Diamond. The game’s highest value BAR symbols, gold, apply a 38x multiplier of your stake for 3 in a row, an amount that’s only exceeded by red 7s and of course those coveted blue diamonds. You can play this game for as little as 20p. The game is provably fair and its RTP is 96.17%. If you happen to land on two cherries, you will get a 3X multiplier. Three cherries will get you a 5X multiplier. The bar symbols have different multipliers; the brown has an 8X multiplier, the blue bar has 18X multiplier, and the green bar has 28X multiplier. The starting point for recording a win of any kind is a single cherry, which applies a lowly 1x multiplier: in other words you simply win back your stake. This is followed by 2 cherries with 3x and 3 which score 5x. Then it’s on to the BAR symbols, with brown, blue and green BARs scoring 8x, 18x and 28x respectively. Finally, it’s gold BARs with their 38x multiplier, followed by an 88x multiplier for 3 red 7s and a massive and symbolic 888x multiplier for 3 blue diamonds. 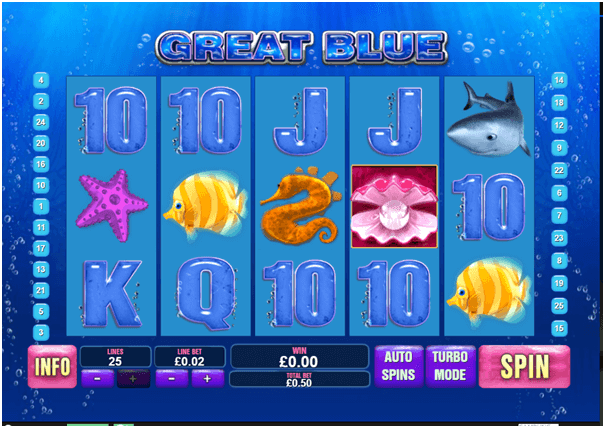 Great Blue is slot game released by Playtech, which is a 5 reel and 25 paylines themed on sea life. The marine life as higher value symbols you can select the bets between £0.10 to £2.50 per line, as Great Blue offers a winning potential of 10,000 coins for the combination of 5 Wild icons. Apart from the classic structure of the base game, the slot also introduces a Bonus game triggered by the Scatter symbols, awarding additional sessions of free spins bundled up with different value multipliers. The highest value symbol in Great Blue slot is the Shark, which is worth 10, 250, 2500 or up to 10,000 coins, depending on the number of symbols that hit the reels. Apart from being the symbol that can generate the highest profit, Shark icon can replace all other symbols (except the Scatter icon), significantly increasing the winning potential by completing any string of icons and doubling the winnings. With at least three Scatter symbols (Pink Sea Shell with a pearl), Great Blue slot Bonus will be unlocked, transferring the player to the new screen with 5 different shells, each with a multiplier and a different number of Free Spins. As soon as the Scatter symbols land onto the reels, 8 Free Spins will be automatically awarded to the player, together with the x2 multiplier. A new set of spins and additional multipliers are then added after the player selects two out of five shells which can contain the maximum of 33 bonus rounds as well as 15x multiplier. Also there is Gamble Feature option to go for double or nothing. Upon entering the Gamble game screen, the player unlocks a guessing game with the objective of correctly predicting the colour of the card facing down. Every successful guess will double the selected betting amount and the player can end the game and return to the main screen by simply collecting the amount won up to that moment. Now enjoy these new slots at BGO Casino with your mobile or PC. With mobile you get 10 free spins more as a new player. Enjoy these awesome slots.